The designer features a drag-and-drop interface for building and working with the design, plus an optional HTML editor for working directly with code and a preview tool that can show how your design will look on various form factors and orientations. The designer adapts itself to your current context (email, landing page, and so on) to provide only those design elements and settings that apply there, but its basic functionality remains the same. It also provides a "foreign content mode", which is activated if you paste HTML from a third-party application directly into the HTML code editor; in this case, the designer 0 know which type of content you are designing and therefore hides context-specific features and provides a more generic design interface. This topic describes how to work with the designer in general, in all contexts. For more information about how the designer fits into the various specific contexts, and for details specific to just one context, see the topics linked in the list at the start of this introduction. 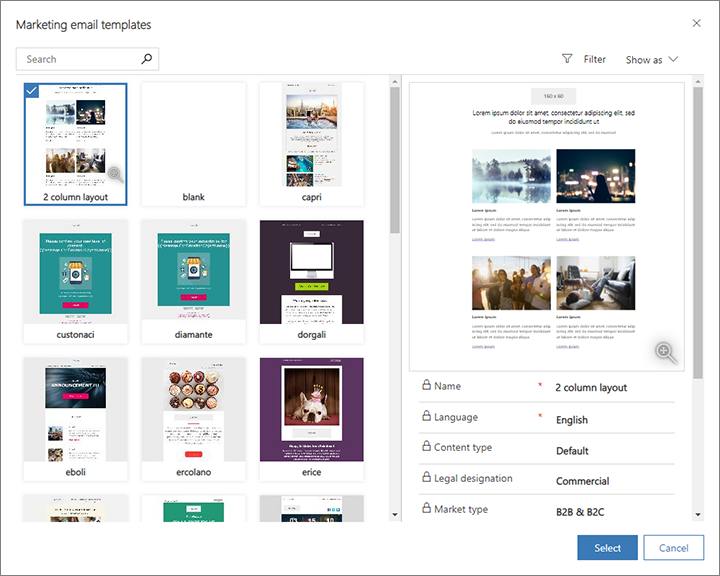 Most non-template entities that provide the content designer also support templates, so when you first create a marketing email, page, or form, you'll be asked to choose a template. The template picker provides many controls for searching, sorting, and filtering the templates. 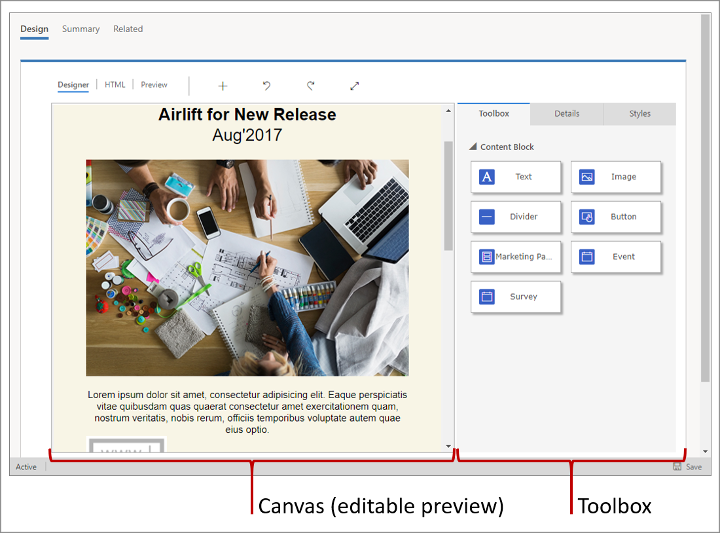 Use these controls to find templates that might meet your requirements, then select a template to see a preview and more details about it in the Preview area. When you've found the right template, select Select to apply it to your new design. Column layout: Sets the basic layout, such as one-column, two-column, and so on. To change this later, you'll need to use the HTML code editor; the graphical editor doesn't provide tools to change the column layout. Page or form type: If you're creating a marketing page or form, this tells whether the page is a subscription center, forward-to-a-friend, or landing page and establishes the basic capabilities of the page or form. Sample design and content: Some templates already include basic design elements, such as logos, typography, color palette, sample content, and more. Other templates provide a blank page that includes only the page type and column layout. You can freely change the sample design and content as you edit and design the page. After you've chosen a template, the designer shows your selected template content and you can start editing it. Your new email, page, or form is created as a simple copy of the template, so any local changes you make won't affect the template, and any future changes to a template won't affect anything you created based on it. Most of the time you spend creating a marketing email, page, or form, you'll be using the designer or the HTML editor to add content, configure design elements, load images, apply styles, and more. The designer features a toolbar and a content area. The toolbar provides a few basic commands and three navigation tabs (Design, HTML, and Preview), which control what you can see and do in the content area. Choose Designer in the designer toolbar to open the graphical designer. It lets you assemble and design your content without using any code at all. In most cases, you'll never need to go to the HTML view unless you want to. Toolbox: To add a new design element to your design, drag an element from here to an appropriate place in the canvas. Each design element represents a specific type of content, such as a text element, image, or input form. The settings and features of each design element vary by type. Properties: Most design elements need to be configured to work. For example, an image needs to point to an image file, a form needs to point to a marketing-form record, and a button needs some text and a destination. When you add a new design element, that element is automatically selected and its Properties tab opens so you can set it up. To configure (or reconfigure) any design element already in your design, select it first, and then open the Properties tab. Style: Use these settings to apply color, spacing, and other graphical options for the overall design. Make the Customer No. field visible only if Existing customer is true. Make the Customer No. required if Existing customer is true. Clear the State address field if the Country field is changed. Change the list of State values based on the country chosen. Change the styles of fields to make them visible, required, and so on. Add custom field-value validations (either when the form is submitted or the field value is changed), such as requiring that Customer No has only six digits. Set field values based on values passed in the calling URL. The HTML editor provides a few handy code-editing features such as syntax coloring and line numbers. You can also apply formatting to add line breaks and indents to make the code more readable; to do this, right-click anywhere in the editor and select Format document from the context menu. 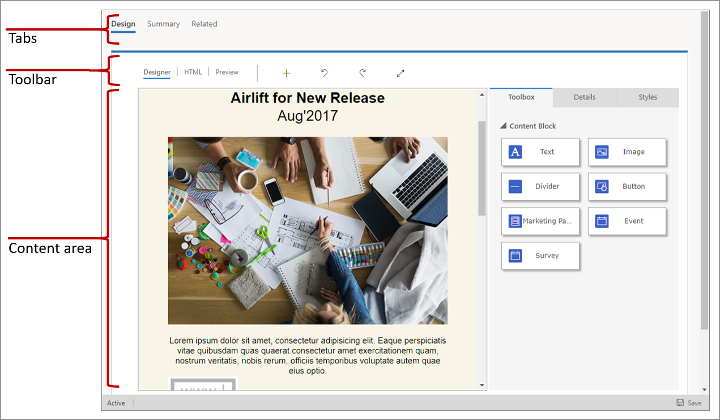 Though the drag-and-drop editor provides an editable preview, this preview is still just an approximation, and includes a few compromises in its presentation to allow for its editing features. To get a better idea of how your design will look, go to the designer's Preview tab. 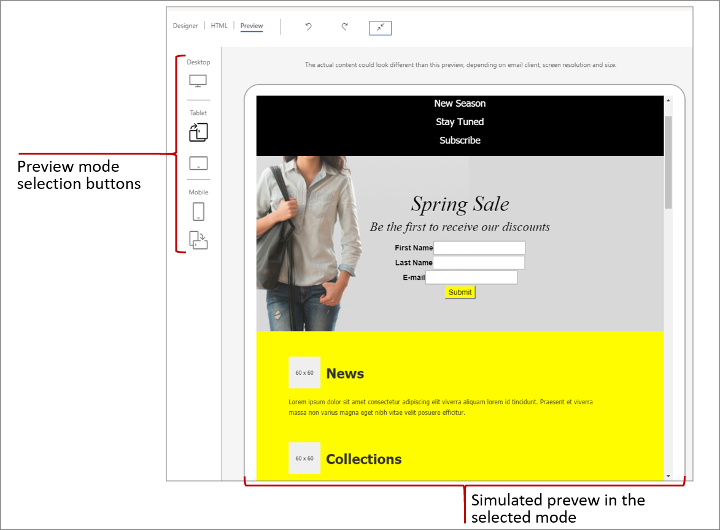 Use the buttons in the left column of the Preview tab to see how your design will look on different screen sizes and orientations, such as desktop, tablet landscape, or mobile portrait. The preview also reflects the responsive design features built into many of the templates. However, the preview doesn't run any custom scripts you might have added (such as for validating form input).